M.K Bellamy is creating Luck & Caz: A webcomic. Luck and Caz thanks you for your interest in our Patreon site! 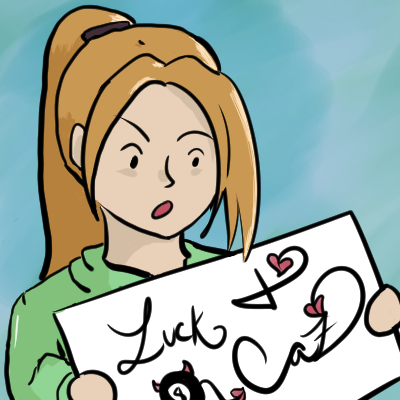 Luck and Caz is an ongoing webcomic. on several social media platforms. Read Luck and Caz HERE. What is Luck and Caz about? Luck and Caz is about a girl named Luck (who doesn't have any) and her devil companion, Caz (who tries to help). Together they are constantly finding themselves in unfortunate situations, or rather untimely, unique scenarios. Anyone who has ever had a bad day will be able to laugh and relate to their stories! “This is Luck, she doesn’t have any. This is Caz, he tries to help." I post four comics a week. Their posting schedule varies depending on the social media platform. Patreon receives all comics early, Tapas receives all comics at once, and other platforms receive them daily Fri-Mon. I hope you find the social media platform that best fits your comic reading needs! If I am not on your favorite social media, contact me and let know so I can look into it! Two comics a week. Starting mid December until mid January. *Patreon Rewards are a small way I can show you love for paying my webcomic love! Patreon Rewards are assorted by monetary ranks. Depending on the amount of your contribution to Luck and Caz, you will gain more access to the process of how Luck and Caz is made, illusive Patreon only comics, including the Patron Only character, Husband, and goodies that won’t be found anywhere else! All patron rewards that require an address will be mailed after payment has been processed! Ah geez, are you still reading? Find more information at the home of Luck and Caz! *Access to comics a week early! Are you a Fiend for Luck and Caz? *Access to all previous tier rewards! *Access to Discord chat as Blighted Role!! *A personal thank you card with a hand drawn sketch! *First Dibs to any future Luck and Caz merchandise. *New Imp Role in Discord Chat! Caz profile page. Will let you in on all his dirty secrets, super powers, and what his astrology sign is!